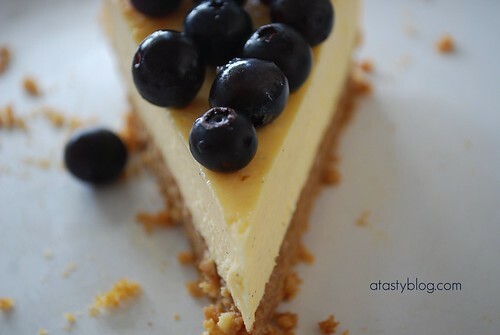 Not sure what you think about this, but I just love the colours and when I saw a picture of it in Bill Granger's "Feed Me Now" cookbook, I knew I was sold. My first confession of today is that this was actually yesterday's breakfast, but as I was having problems logging onto typepad, I wasn't able to share the experience freshly - does that make sense ? However, being a bit of a visionary when it comes to preparing food in any case, as my wife would let you know, I already had the vision of my next post a few days ago as reading "Today's breakfast", so here it is, and of course, it's so simple. First up, heat the olive oil in the frying pan on medium to high heat, then through in tiny bits of half a hand full of ciabatta bread, together with some chilli powder or chilli flakes. As soon as the the chilli begins to sizzles, through in some radicchio leaves (I advise about 3 strips) quickly followed your eggs - break them slowly so that the egg yolks don't scatter. Fry to your liking, but for this I kept the yolks a bit runny. You can place the eggs on top of lightly toasted ciabatta, which is what I did, or just on top of a plate. When ready to serve, throw the remaining radicchio leaves on top, sprinkle with sea salt of chilli salt like me, et voila, fried eggs, with torn bread, chilli and radicchio leaves. Sometimes the best things in life are so simple. I showed the pictures to my kids and of course they said,"you always make the best stuff for yourself daddy" but I reminded my daughter that she didn't like radicchio, but smartly she replied "I'll have everything except the red leaves"
Strawberry Vacherin - What's That Then ? Strawberry Vacherin After, originally uploaded by Lameen. Well ! 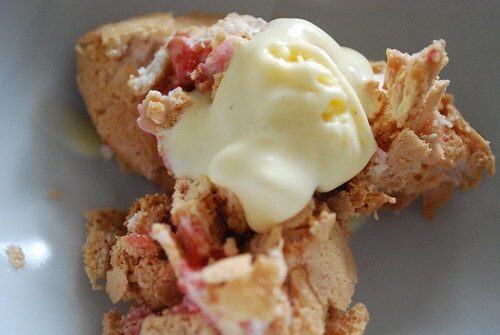 It's like a meringue made with strawberries and it's so simple, you won't believe it and it taste great too. Ideal as a compliment to home made ice cream, because you need egg yolks for ice cream (recipe for this on next post I promise, God willing) and you don't want to waste egg whites. So what do you do ? 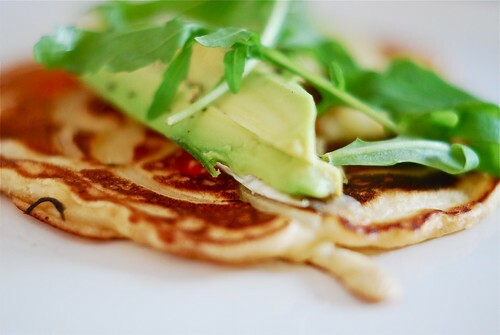 Simple, whisk 3 egg whites until soft, then add 100g caster sugar and whisk until thick. Hull 4 fresh strawberries and mash them with about one dessert spoon of caster sugar and fold it gently into the egg whites mixture. I added 4 crushed pink peppercorns, but this is an option - my touch entirely to get a contrast of the sweet strawberry with the spicy peppercorn. After that stir gently and place about 8 moulds onto a lined baking sheet into a 150C oven. Bake for about 40 minutes until the meringue structure is firm on top and not soft when you push at the sides. Take out of the oven, wait to cool and gently peel of the baking sheet. A word of caution, this isn't going to look very pretty, because the meringue is not supposed to be stiff like a biscuit, but don't worry and just follow one of my main food philosopies "if doesn't look great but taste amazing, then it's fine as it's what it tastes like that counts" In fact, my daughter already knows this and when I tried to serve this to guests, I was a bit worried, but she reminded me about my philosopy - daughters - always looking to comfort their dads. OK ! if you want to serve this, ask people first if they want it, and then put it onto a plate and cover with ice cream, like I did. They'll forget about the look and the taste will carry their taste buds away. Inspired by a recipe in Bill Granger's "Feed Me Now "
Mini Crumble Apple Cake, originally uploaded by Lameen. Another tasty experiment. 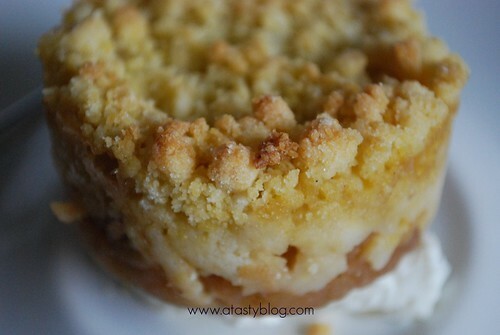 I was thinking how can I make mini apple crumbles that have a slight cake effect, whereby as opposed to this separation between apple/fruit and crumble, they could be sort of meshed together and so I thought..... How will you look like Mini Crumble Apple Cake. OK ! let's play with the apples first. Take two apples, skin them, shred one with a grater and cut the other into as tiny pieces as possible, mix with about 1 dessert spoon of caster sugar and some ground cinnamon. Place the apple mixture equally into 4 lightly greased ramekins - Le Creuset if you have them. For the Crumble: Now ! it so happened that for dinner that night I was making something that only needed egg whites from 2 eggs, so as I hate to waste stuff, I thought I've got two egg yolks to play with. So mix together about 100g plain flour, 50g not too soft butter, 2 dessert spoons of sugar and 2 egg yolks and you should be able to get a crumbly mixture together after some severe meshing with a fork - I recommend using a fork to make the crumble because egg yolks and your hands aren't going to go well nor smell nice afterwards. 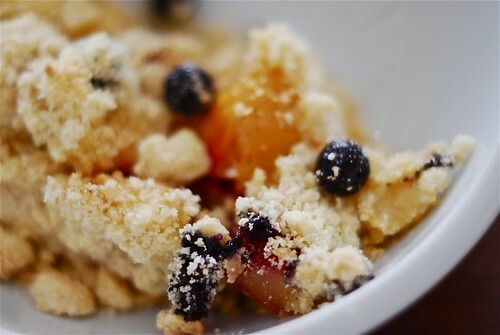 In any case, you should get this yellowish crumble like texture. As the baking time won't be long in 4 ramekins, you need to bake the apple mixture in the ramekins for about 10 minutes first on 180C. Take them out and share half the crumble mixture equally between the 4 ramekins pushing the mixture with a fork so that it meshes with the apples. Spread the other half afterwards but don't press to tight as you still want the crumble texture on top. Bake for another 10 minutes until the crumble get burnt brownish on top. Serve with mascarpone on top or upside down - for the latter, you need to turn the ramekin upside down on to a plate and beat slightly. It taste delicious both ways of course. Enjoy ! Italian Brekkie (Breakfast), originally uploaded by Lameen. 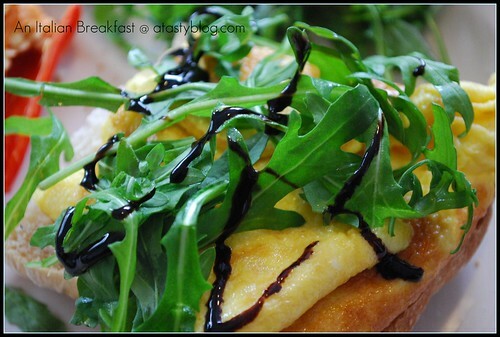 My version of an Italian inspired breakfast, with souffle style omelette on ciabatta bread, topped with fresh rucola and garnished with balsamic vinegar cream. Before making the souffle eggs, turn on the grill until it is quite hot, then break 3 eggs, but separate the egg yolks and the egg white - you beat the egg white until white and fluffy, mix in the egg yolks, place into a medium hot frying pan, cook for about 2 minutes, place under the hot grill and watch the eggs puff up, careful that it doesn't burn on top. If you want, place grated cheese on top of the eggs and when it has melted, remove from the pan and voila, it is done. 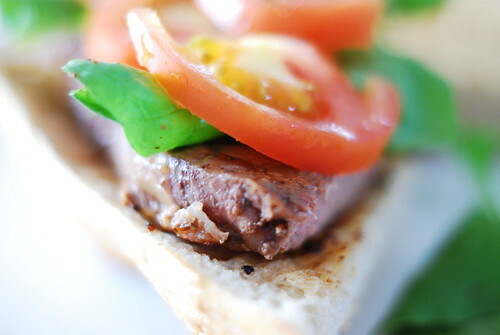 Place on top of day old ciabatta, topped with fresh rucola and balsamico cream, bellissimo.